Posted on 10 August, 2018 at 11:16 am. Google’s machine learning algorithm has finally proved what the rest of the world already felt they knew. 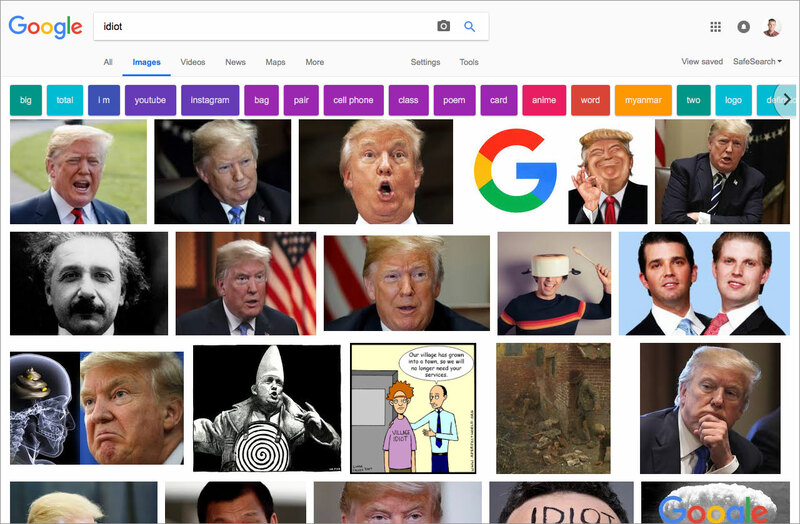 Type the word idiot into Google’s image search and the majority of the images are of Donald Trump. Given that the Googlebot crawls almost the entire web and definitely every major website in the Western world, we can guarantee that the advanced machine learning that it uses has given us the correct answer. The only last thing for us to do is update the dictionary, so that when you look up ‘idiot’ in the dictionary you see a picture of Donald Trump. 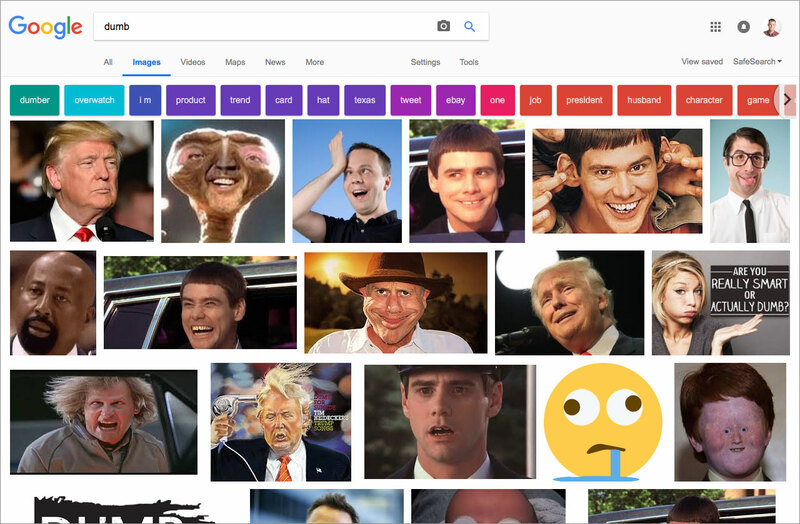 What is the real reason Google shows pictures of Donald Trump when you do an image search for ‘idiot’? Undoubtedly it would have begun with a few articles that had named Trump as an idiot. As people saw the trend they have taken the opportunity to begin a process referred to as Google Bombing. Google bombing is where an attempt is made to make a search term come back with an unexpected result. In the past people have been able to write programs to cause this, but the Google Algorithms have become so intelligent they have largely put a stop to this. But they can’t stop the masses. If enough people say an orange is an apple then that is how Google will see it, but undoubtedly Google would change their algorithm because we know this is not true. However, Donald Tump is an idiot and we know that to be true. He also figures quite highly for ‘dumb’ as well, but strangely is not dominating ‘dumb idiot’ or ‘stupid’. Where has the ‘View Image’ button gone from Google Image Search? Posted on 20 March, 2018 at 6:22 pm. Back in February 2018 they removed the ‘View Image’ button from the Google Image Search. This was removed due to the insinuations by photographers and publishers that Google was allowing people to steal their pictures. According to some media sources such as Search Engine Land this pressure came largely from Getty Images who want to reduce copyright infringement. If you view Google Image Search in a similar way to Napster or torrent sites like The Pirate Bay, you can see their argument. The ‘View Image’ button bypassed protective code blocks and allowed users to easily return a unique URL that allowed people to download an image that they often did not have rights to. You can still download images, but you will need to visit the site first. The digital equivalent of looking the shopkeeper in the face while you pilfer his store. Many sites have blocks in place that make it hard to download the image for the average user. In some cases, you need to hunt the code to gain access to an image. Many of the sites that Juggler Design make block all right click functionality preventing the theft of any content. If you still want to be able to view image just use Bing. It crawls the web just like Google and in some ways, has a better interface, but it is different and takes some getting used to. Another alternative is to use one of several Chrome extensions that have been developed to bring back the ‘View Image’ and ‘Search by Image’ buttons. Note: I haven’t tested these myself and am not endorsing them. In the end, there is no legal right to download an image from the web. Although it is not a crime it is a breach of civil law that is covered by international copyright laws. But we should not be living in fear that others might seek financial compensation, but rather take the moral path and think about creative ownership and the value that it brings to society.